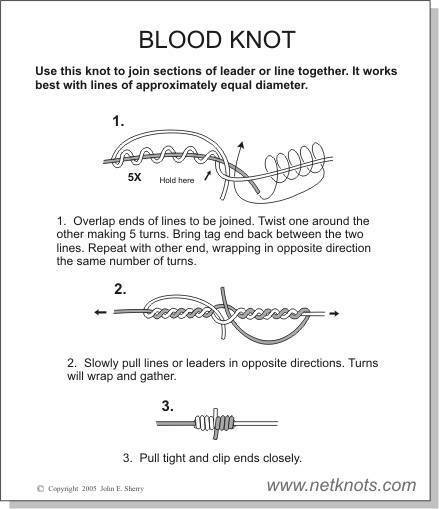 The Blood Knot is also called the Barrel knot. It is commonly used to join mono line to mono line. This knot is much more apt to hold the original strength of the mono line. In my opinion, this knot is the best and strongest method to use to attach mono line to mono line. There is no other knot that compares to this for this propose. The only real disadvantage to this knot is the fact that it is a bit tough to tie but with practice, it can be mastered. 1. Cross both ends of the line to form an "X", leaving at least 8" of overlap. 2. Wrap one of the tag ends around the other line end five times. Pass the end from the other side down through the "X" formed by the intersection of the two pieces. 3. Pinch the line at this point and with the other hand wrap the free end around the standing piece in the opposite direction of the first wraps five times. Pass this end through the same loop as the first end but in the opposite direction. 4. Wet the knot while holding both ends together and pull on the standing parts to tighten. The easiest way to keep the ends from slipping through is to hold them in your teeth. Make sure you don't put any pressure on the short ends pulling the knot tight. 5. Trim the tag ends as close as possible.